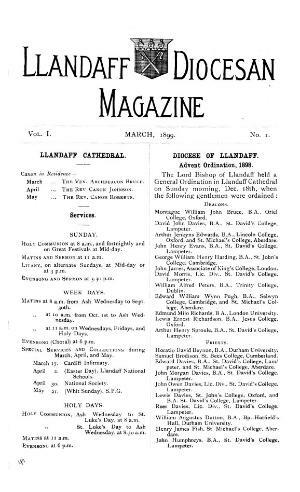 A quarterly religious periodical serving the Llandaff diocese. The periodical's main contents were reports on the church's work in the diocese, alongside denominational and missionary news. The periodical was edited by C. E. T. Griffiths, William Andrews Downing (1851-1907), Lancelot Lewis and Lemuel John Hopkin-James (Hopcyn, 1874-1937). Associated titles: Croeso (2000).